My saddle bronc career was short-lived and plagued by lack of talent. Others were made for it. This month’s Western Horseman Magazine contained a picture of a young man being lifted into the blue sky by a powerful and picturesque paint horse. His spurs were up in the neck of the horse and his hand held the split reins out in front of his tucked chin and eyes fixed on the neck of the horse. He was in the middle of the corral so I assumed this was an unplanned bronc ride, which is partially what amazed me at the pose which he such on such a quick notice. This picture will forever go down as one of my favorites and also the exact opposite of what my bronc ride looked like. I will spare you the complete story (partially for fear that I may someday need a story to tell here) but it was my first time on a saddle bronc horse. After a few hours of training (it seemed shorter than that as I was lowering myself into the saddle), my horse was in the chute and a friends Association Saddle rested on its withers. I measured out the correct amount of rein and fished it through my quivering hand and fingers. When I lowered myself into the saddle, I couldn’t get my feet into the stirrups on account of two reasons: 1) I was holding my hack rein with my right hand, my left hand is virtually worthless in all endavors and 2) my legs were shaking so bad it was like trying to get a drink of soda through a straw while jumping terraces in a Ford Fairmont…too much movement and to small a target. I get the opportunity to fight bulls at a lot of camps and schools and one thing I have seen for certain…”You always land where you look!” In Matthew 14, without tying himself ot a large herbivore, Peter gets this same lesson. Jesus sends the disciples ahead of him on the sea while he dismisses the crowd (Matt 14.22). The disciples hop in the boat and head across the sea while Jesus goes away by himself to pray (14.23). When he finishes his devotional time, he catches a glimpse of the boat, out a ways from the shore, struggling against the wind (14.24). Jesus wraps up his prayer time and heads out at 3 a.m. to catch them on the lake (14.25). His disciples freak (as anyone would probably do), but Jesus gives them a pep-talk to calm them down (14.26-27) and here’s where the story gets really good. Peter, doing the thing that Peter always does, speaks up and says to Jesus: “Lord, if it’s you, tell me to come to you on the water.” (14.28) The disciples in the boat have to be getting their phones out to put this on vine or the cultural equivalent. You can almost imagine them elbowing one another: “Would you get a load of Peter?”“; This guy…smh!”; “He’s joking, right?” They have seen him speak up at the wrong times before but this is all kinds of stupid. The greek word that Jesus uses for doubt, distazo, is only used on other time in scripture. Matthew uses it at the very end of his book, when he tells of the resurrected Jesus visiting the disciples on the mountain. Standing there before them was Jesus, still some doubted. Both times, people are standing in front of the Son of God who is actively proving who he is and that he can be trusted, yet doubt comes into the picture. How has Jesus shown you that he can be trusted? What words or experiences has he given to show you that he is capable? When is the last time you stood before him, saw what he was capable of, and trusted him? I learned my lesson the hard way of looking off a bronc, but have been more hard headed when it comes to Jesus. It took Peter a couple review lessons to get it as well. Make today the day when you tuck your chin, set your spurs, and keep your eyes focused on him and him alone. 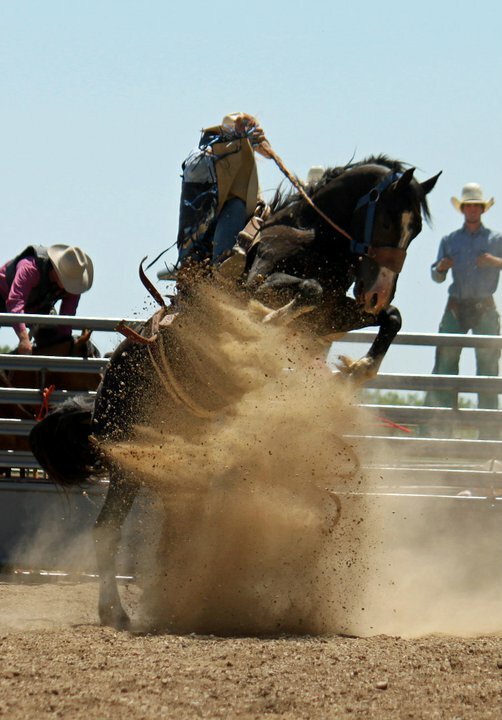 Posted on March 5, 2014 March 4, 2014 by Travis GailPosted in Devotional, RodeoTagged Faith, Matthew, Saddle Bronc. I so love your analogy here, fabulous job!!! We all, myself included, need to keep our focus on Jesus because He is the ultimate authority and power that will “land” us exactly where He is looking out for us to be!!! Exactly where He wants to use our talents for His glory!!! Just like the bronc rider focusing on his task at hand. Focusing to the point we are not distracted by the whistles in life. We must focus on the task God has set before us, using Him as our filter for all whistles (outside distractions). He is the one I, we will answer to all alone (but with Him and not truly alone) at the end of our ride. Great job, my brother in Christ!! !